Children begin hearing Bible stories at a very young age, both in the home and in the church or classroom. But without context, these stories often present as a disjointed collection of individual events. This title will give little ones a “big picture” of the Bible—from what it is to how it was written to the message it shares of God’s love for us. Such context will help children to better understand the Bible stories they hear and how those stories relate to their own lives. "What's the Bible All About?" 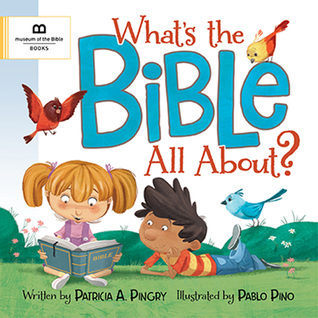 is a hardcover small board book for young children that gives the history of the Bible and talks about the Bible being written on scrolls, which I find to be very interesting, especially for young, young children. I believe it is so important from such an early age they hear and learn about the Bible. This book does a great job at presenting some history along with why the New Testament is written. This is another book from the Museum of the Bible Books. I give this book 4/5 stars. A favorable review was not required.